Chondromala, Kumudini or Crested floating-heart (nymphoides cristatum, family: menyanthaceae) is a aquatic flowering plant with long branches. The branches of the floating herb reach the surface of the water. Roots grow from nodes. It is a common aquatic plant of Bangladesh and found throughout the country's beel-jheel, canal and pond along with Water spinach, Keshordam (Creeping water primrose), Bladderwort and Alligator weed. It is also found in India, China and some countries of Southeast Asia. Leaves are simple, orbicular, deeply cordate, purplish at the edge, veins are green and spread like nets. The sepals is not adjacent to the petals, almost divided. Flowers are white with yellow centre, petals 5, adjacent, glabrous. Each lobe has a crest down the middle of each lobe. Fruit is a capsule, broadly ovoid, subglobose. Seeds 10-20, pale yellowish brown. Nilkanthi or Blue Snakeweed (stachytarpheta urticifolia, family: verbenaceae) is a semi-erect herb with branches. Stem is quadrangular and slightly woody. It can get a height of 2 m. In Bangladesh it is found in Chittagong Hill Tracts and greater Sylhet area. The beautiful flowering plant has not yet become popular in the country. The propagation of the perennial plant is caused by seeds. Due to its dazzling purple or bluish flowers the plant is very popular throughout the tropical regions of the world. Serrated-leaves are shinny green, simple, opposite, elliptic, 4-7 cm long, 2-5 cm wide, sessile. Midrib and veins clearly visible. Flowers are very attractive, scented, purple in color with white mark in the centre, sepals 5, petals 5, borne on very long terminal inflorescence, quite curved, looks like snake tail or rat tail. Flowering occurs in the rainy season. Fruit is a capsule, oblong, blackish. Kurchi or Girimollika (holarrhena antidysenterica, family: apocynaceae) is a small to medium-sized deciduous tree with branches, attaining a height of 6-7 m. Its bark is not smooth and slightly grey in color. 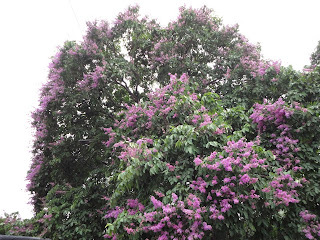 The tree is one of the most beautiful flowering plants in Bangladesh. It is mainly found in the hilly areas as well as Sal forests in the country. The loving tree is native to Indian subcontinent, including Bangladesh. Leaves are simple, green, glabrous, opposite, nearly sessile, elliptic-lanceolate with pointed apex, 4-20 cm long and 8-10 cm wide. Flowers are white, 2-4 cm wide, slightly tubular at base, scented, clustered. Sepals 5, petals 5. Flowers bloom profusely at the beginning of spring. In this time no leaves can be found in the tree! Fruits are cylindrical, borne in pair, 20-35 cm long, many-seeded. Propagation of the plant is caused by air layering and root sucker. It is grown in garden and parks as an ornamental plant.